Maybe you're a homeowner who wants to try living off the grid. Maybe you want a backup plan in case of a power outage. During major storms, many homeowners are left without power for days or even weeks as power companies rush to repair downed lines and other issues. Having a generator enables you to have warm water, light, and electrical power while you're waiting for the return of your usual power sources. 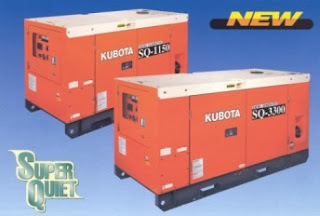 Diesel generators are a popular choice for many homeowners who choose to have a generator. Why diesel? For starters, fuel savings tend to be a feature of many diesel generators. And, given the prices of diesel and other fuel, that sort of savings is a relief. In addition, many of these generators are incredibly quiet. If you've been in a neighborhood with a power outage and have heard a generator several blocks over, it was likely a gasoline generator. Gasoline generators tend to be inexpensive, but they are very noisy and cause a good bit of pollution. Keeping noise low is especially important if you want to use your generator at night, or if you plan to use one full-time as a source of off-the-grid power. If you want a generator that can switch on automatically, you might want to consider a diesel generator. Unlike most gasoline generators, many diesel generators can turn on automatically in the event of a power outage. This is important if you have frozen foods, poultry incubators, or need continuous power for any reason. Some generators even have a self-testing option - they are able to do a test start weekly or monthly, so you'll know if something's amiss before you need to call on your generator for emergency power. Even if you've already decided to go with diesel, picking a good generator can be difficult. Reading online reviews can be useful, but you most likely would also benefit from expert opinions. Ask representatives at local hardware stores. Talk to friends who have experience with generators. Doing your own research is helpful - you can read about generator types, sizes, etc. When you educate yourself on generators, you'll gradually develop a feel for what you need in a power source. You'll also be able to tell what wattage you need - higher-wattage generators have the ability to supply more power, but they are also more expensive. In addition, look for warranties on generators you've chosen. Decent warranty coverage is a smart move, especially if you've never owned a generator before. If your search comes to two equal generators with one having good warranty coverage, the warranty-covered one is a wise choice. Like all major purchases, the purchase of a good generator shouldn't be made in haste. Assess your needs, talk to owners and experts, and do your research. If noise is a priority, see if you can hear your chosen generators in use. When you take your time and get the right generator for you, you'll be rewarded with quality power whenever you need it.